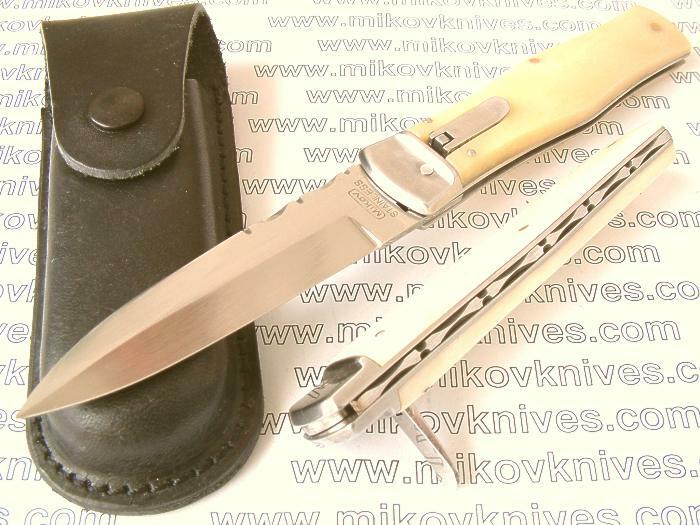 First four models of Mikov automatic knives were introduced in 1989. Now two decades later you can choose from almost 100 different varieties. All Mikov autos are side openers, blade is sharp only on one side. Unlike on other automatic knives the firing spring (two firing springs in new models) can be easily replaced. The spring can be also removed (cut in half) - that way you can turn the knife into a manual folder. Three videos (youtube.com) on How Mikov auto works, How to remove the spring and How the manual Mikov works are right here. Mikovs are not high-tech autos but they are well designed, reliable long lasting users with very safe locking mechanism. Great value for the money. All singlebladed models (including kits) are available for left-handed users as well (L). NEW: All Mikov autos (also multibladed, RWL-34, damascus) can be now ordered with EXCLUSIVE or UTILITY (clip point) blade. Pocket clip can be added as well. Lead time - 2 weeks. E-mail me for prices. Mikov autos have scales made of following materials: black ABS plastic with GOLD Lion or Swordsman logo, black or yellow ABS plastic with Swordsman logo, Cocobolo and Turkish Walnut, real stag , buffalo horn and natural bone. Stabilized (dyed) bone and exotic woods are used on exclusive damascus and RWL-34 pieces. Blades are made of 440A, Bohler N690 tool steel, RWL-34 or Damasteel. For more info visit DAMASTEEL. MIKOV tactical autos with Black Teflon coated blades are also available. Exclusive line (not available from other dealers) includes models with rear bolsters, modified dagger blades with fileworked spine, clip point utility blades, some models have fileworked backspring. All exclusive models come with quality leather sheaths. ABS models with utility grind have pocket clips instead of sheaths. 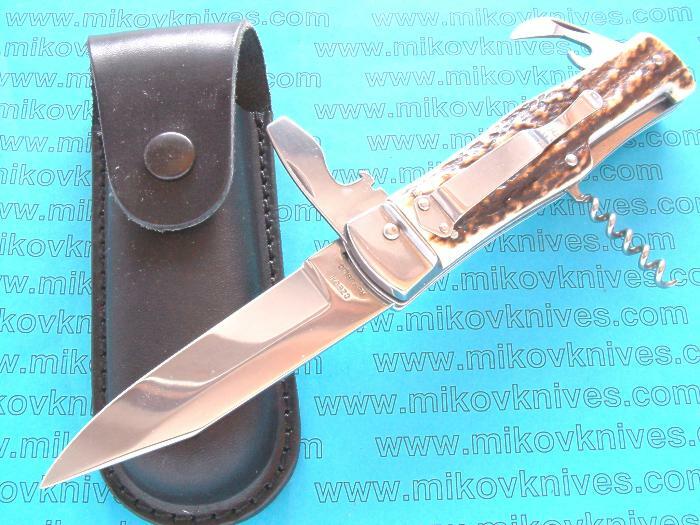 Examples of Mikov autos customized with engravings and carvings are here. Customized fixed blades are available as well. All custom knives are made on order only - but time to time I have some pieces available for immediate delivery. Almost all Mikov models (also left handed) are now available as kits. For custom and customized Mikov autos built by Mikov enthusiasts please check this Fotki album. I also offer autos made by AKC Italy - Leverlettos, Speedhunters and 8" Leverlocks with shell pullers. Blades are made of 440C stainless steel, scales of black ABS plastic, exotic wood (cocobolo, snakewood, pink ivory), horse bone, stag and horn. If you have any questions e-mail me. Please write "MIKOV" in Subject line. 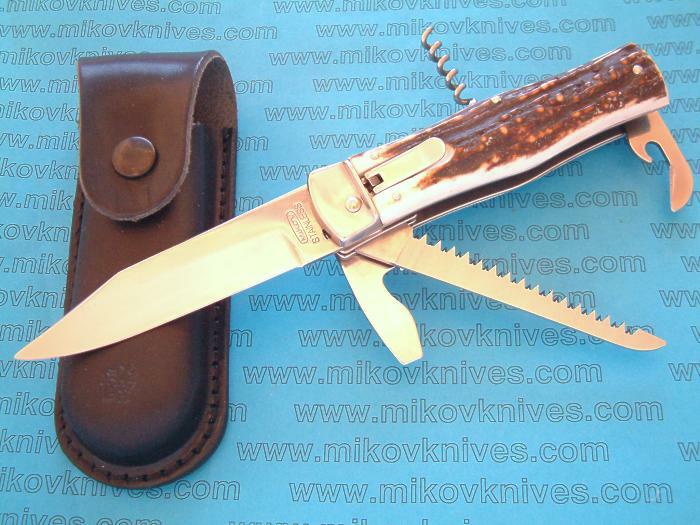 For non-automatic MIKOV knives please visit my older web site.